Home / Blog / How many leads are you NOT capturing with your website? If your business is like most small to medium-sized businesses, you probably don’t have a team of social media and marketing experts tracking your website’s every click thru or activity. Though you should be. You’ve invested quite a bit in your website, do you know how much of your daily business activity it represents? You should know exactly how many leads your website is producing, how many are converting and most importantly, how many of those visitors it is NOT capturing. If you’re like most smart business owners with a sales team (of 1 in some cases; me, myself, and I), you set very specific requirements on yourself or your full-time sales staff. Along that same vein, have you implemented those same expectations from your website considering it’s working 24 hours a day? 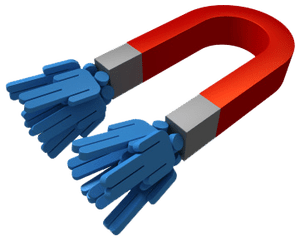 Your website should be a lead generation magnet. That is, you should be collecting information from your site visitors at every chance you get. After all, that’s its purpose, isn’t it — to create customers and drum up new business? But are you making the most of it? Your site exists to help you generate business. The way to make that work is to actively capture leads with the intention of turning them into customers. If you don’t collect contact information and nurture a relationship with these potential customers, you’ll probably never see them again. Effective strategies to capture leads have a significant financial impact. Think about your business analytics. When you get a lead, what are the chances of him or her converting and becoming a customer? Is it 10%? 1%? Do the math. What is the long-term payoff of a single customer? Once you’ve calculated how much a single lead is worth, use this knowledge to drive your site optimization efforts and start cashing in on those missed opportunities. Keep reading to find out the most common reasons why your website isn’t generating leads, and what you can do to turn that around. You don’t get enough traffic. You don’t offer any valuable incentives to provide lead information. You don’t have any calls to action (CTAs). Your lead forms are complicated. Your website is outdated, ugly, or just plain c.
Yes, this blog post is about generating leads. However, traffic is still relevant. You will not capture leads if no one can find your website, so you need to optimize your website to rank well in search engines. It doesn’t matter how great your website, product, or service is if no one can find it. Learn about what you can do to make your website work for your business. If you’re using a landing page to host your form and a call to action button to direct visitors to the page, the CTA button should be a bright, bold, and contrasting color from the rest of your site content. Use your website to capture leads offline. If you have a customer service team available to answer calls, make your phone number prominent and collect lead information over the phone. Some people are more comfortable sharing their contact details when they know they are speaking to a real person. Have good content. We can’t emphasize this enough. If your content is not clear or doesn’t connect with the website visitor, they will bounce off your page never to be seen again. Make your content about the visitor, not you. If your website has a blog, add CTAs to the end of every post. Ensure your website is responsive, or easy to use on both mobile and desktop versions. Nowadays, most website visits are from mobile devices, so make sure your mobile visitors have a great user experience. Add testimonials with photos, links to your active social profiles, and client logos to your website. This makes you look credible and adds a layer of trust for site visitors who aren’t familiar with you. 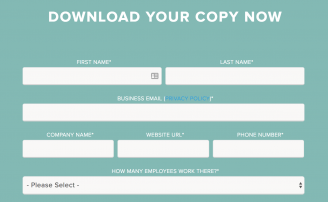 Keep in mind that your lead generation form, call to action button, and call to action copy are not set in stone. Change out one factor at a time and A/B test to see if this affects your results. For example, see if you get more form fills if you change the color of your CTA button. Test out pop-up CTAs and check whether you get more traction with “Start your trial today” versus “Start your FREE trial today.” Even if the leads keep pouring in, it’s always a good idea to keep testing. Do You Need Help Capturing Leads? Website design and development: We can create a beautiful, responsive website with top-notch design and functionality that serves your visitors on mobile and desktop devices. Well-designed websites are more likely to capture leads. SEO: We will help you rank highly on search engines, which will bring you more traffic and greater opportunity to generate leads. Content creation: TuiSpace’s copywriting service ensures your content is conversion-ready — full of clear and action-oriented CTAs and writing that will resonate with your audience. Ready for more leads? Click here for a free quote and to start amplifying your results.